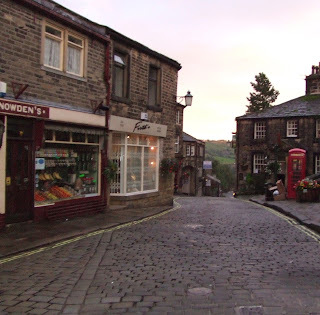 When I saw this cobbled street in Haworth a few years ago, I wondered if I'd ever finish my book. The village inspired me to continue even when the task seemed impossible. Good thing I kept at it because now that it's done, I have time to meet other writers who share the same struggles. For too long, writers need to stay immersed in their thoughts in order to get the deed done, but during those months they lose touch with friends and acquaintances. The blogs I've been reading recently have provided a tremendous outlet for connecting with other writers and readers. After so many years typing out pages of text, I can finally enjoy their company. The writing was hard, but now it's fun to enjoy this new part of the adventure. That lonely journey down the cobbled street has been worth every step, especially when I learn how much everyone is enjoying my book. Just recently, I received a great reaction to my book from a woman who writes many reviews on Amazon. I'd like to share it with you. A New Portrait of the Brontë Sisters?